Attracting birds is easy if you add a twist to the old saying, "the way to a bird's heart is through its stomach". The most cost effective, as well as natural way is with berry bushes. From mid-summer through winter, dozens of plants share their berries with wild creatures, which in turn, helps wildlife build fat storage for winter survivial. If nature failed to provide her huge offerings of wild berries, many animals would be left out in the cold to die. In fact, over 225 of our familiar spring and summer migratory birds cannot substitute on birdseed alone. Robins, thrushes, bluebirds and waxwings are rarely seen at a birdfeeder because seeds are not a major part of their diet. Instead, they rely on insects, fruit, berries, nuts, and nectar. However, don't be fooled. Not all nursery labels that promise berry-producing bushes ever do so. And, not all berries are relished by our feathered friends. There are several reasons why plants won't produce berries, as well as why birds won't gobble the berries. When the flower buds of berry bushes begin to open, they are susceptible to damage from frost. While flower buds can survive temperatures as low as 24 degrees Fahrenheit, the open blossoms of berry bushes can be killed at temperatures below 27 degrees Fahrenheit. Alternate bearers bear their fruit every other year. These plants flower and fruit so heavily one year that it depletes their food supply, suppressing the following year's flowering and fruiting. Once they have accumulated enough energy, they flower and fruit again. Crabapples are the best known plant in the group, including the Sargent crab "Bob White" apple, one of the best crab apples for attracting birds. Red Jade Crab (Malus 'Red Jade') is alternate bearer, whereas the Sargent Crab (Malus sargentii) produces fruit every year. Applying nitrogen lawn fertilizers too close to fruit trees can cause excessive vegetative growth, at the expense of flower production. Do not apply lawn fertilizers within five feet of the spread of the tree's branches. Because a shrub bears extremely showy flowers, is no guarantee that it will bear berries. This is because the flowers are sterile. For example, the popular rnamental trees Kwanzan Flowering Cherry (Prunus serrulatta 'Kwanzan') and the Royal Burgundy Flowering Cherry (Prunus 'Royal Burgundy') produce clusters of double pink flowers in spring, but no berries for birds. The same is true for the Spring Snow (Malus 'Spring Snow') crabapple and the Japanese Snowball Virburnum which produces white flowers in spring, but no berries. While most viburnum species provide winning bird food, there are several exceptions. The Highbrush Cranberry Bush (Viburnum opulus nanum) does not flower, and the small Dwarf European Cranberrybush (Viburnum opulus 'nanum) rarely flowers. In addition, the snowball group viburnums, which include European snowball (opulus Sterile), Chinese snowball (macroceplalum Sterile), and Japanese snowball (plicatum) are also sterile and produce no berries. Many plants must be pollinated in order to produce flowers, which in turn, become berries. Some plants have perfect flowers which means each flower has both a stamen and a pistal. These plants are known as monoecious. Pollen is carried to the stigma of the same flower on the same bush by insects, birds, or wind. Allegheny Serviceberry (Amelanchier leaves), elderberry (Sambucus canadensis), and chockcherry (P. virginiana) are noted for this. While the Viburnum (P. Viburnum) is monoecious, it should be planted in groups of three for sufficient pollination. While blueberries and bittersweet will set berries with just one plant, planting two or more will increase the amount of berries produced on each plant. The other group of plants are dioecious, meaning that there are separate female and male plants. The female plants produce berries, but only if they are fertilized by pollen from a male plant of the same variety. To ensure adequate pollination and maximum fruit to set, male and female plants should be grown within 100 feet of each other or roughly a ratio of one male plant to every four females. Dioecious plants include the bluish berries of junipers (Junipers) that are loved by robins, thrashers, bluebirds, catbirds, cardinals and cedar waxwings. Hollies (Ilex) are also deciduous plants. However, because of the many species of holly, it is best to plant a male and a female of the same species to ensure fruiting. In the case of the winterberry, the (Ilex 'Winter Red') needs the (Ilex 'Southern Gentleman') as a pollinator since both varieties have the same growth habits. To be on the safe side, read the label that comes with the plant. The label usually tells you if you have a female shrub. If all this sounds like a lot of trouble, you might consider a parthenocarpic shrub, such as (Ilex Coronet), that is self-pollinating with no need for a male. But as in all things, there's no such thing as a completely free lunch. Generally a parthenocarpic berry crop is much lighter than a regular one produced by fertilization. Even by following all the above guidelines, your bushes may be devoid of berries. Since bees are mainly responsible for pollination, cold weather, rain and insecticides, can reduce bee activity and limit pollination. While berries on the Serviceberry and American Elderberry are gobbled by the birds as soon as they ripen, others may remain on the bushes long into winter and early spring. These berries are known as emergency foods, and become an important winter substance if no berries are available. There are various reasons for their low appeal. The Black Chokeberry (Aronia melanocarpa), Common Snowberry (symphoriecarpas), and American Highush Cranberry Bush (Viburnum trilobum) need a repeated freeze-thaw cycle in order for the berries to soften. There are other berries that the birds simple find not palatable. This is especially true with the dozens of garden viburnums that plant breeders have developed. 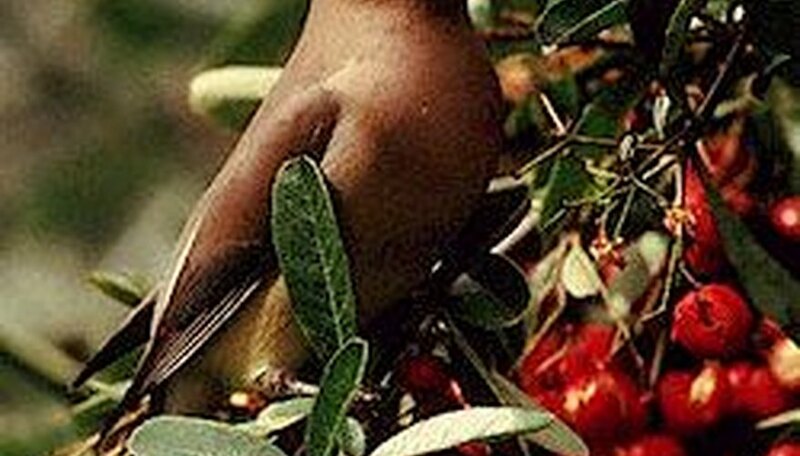 Due to changes that occur in breeding, the berries lose their appeal to birds. It's not uncommon to see the bright red clusters of fuzzy berries on the Smooth Sumac (rhus glabra) and the Staghorn sumac (rhus typhia) remain on the plant far into the winter. While the (Pyracantha) is commonly mentioned as a favorite of robins, jays thrashers, waxwings, cardinals, mockingbirds and thrushes, the "Apache" and "Mohave" varieties are exceptionally resistant to bird feeding. This is also true with laurustinus viburnums, and the yaupon holly. In addition, some berries are too large for birds to find palatable. Plant breeders are always trying to produce plants with bigger berries. This is understandable, because they strive to propagate plants that are attractive to people not birds. While some birds, such as jays, robins, and woodpeckers can easily peck out larger berries, most birds prefer a berry size of 1/2-inch or less in diameter so that they can swallow the berry whole. Many popular crabapples, as well as cultivated blueberries, cherries, blackberries, raspberries, currants and grapes feature berries that are to large for birds to put in their mouth. This is an important reason why you should stick to plants that are native in your area. Since the birds have evolved along with these plants, the native varieties are better adapted to providing local birds with the nutrition they needs.